Ahem. Please pardon my quaking voice and trembling hands, but I'm here to officially announce my participation in a new sewing contest on the blogosphere that's hopefully gonna blow your mind. I, Andrea of foursquarewalls, wee little awkward blogger in a tiny corner of Internetland, am one of the six contestants in the new Project Sewn series hosted by the two talented and fearless multi-tasking women behind Simple Simon & Co. and Project Run & Play. If you're active in the online sewing community, especially if you sew for your own kiddos or enjoy reading about other people who do, then you most certainly know about Project Run & Play -- the ongoing series of contests where bloggers sew an outfit for their children based on an assigned weekly theme. Readers vote on their favorite design, and one person is "sent home" at the end of the voting period until there are three designers standing. They've also added on a sewalong, so readers can sew with the themes and post their projects to a link party for a chance of their own to win a separate prize. Am I right or amirite? I'm prepared to sew like a mad woman and bring my A-game, though. My sewasaurus rex is aroar. The contest and voting officially begins on May 7th. If you're interested in seeing the themes and following (or sewing!) along, head over to the Project Sewn site. And be sure to enter the grand opening giveaway for practically an ENTIRE SEWING STUDIO -- including a Singer sewing machine, adjustable dress form, like a million spools of thread, rotary mat & cutter and some fat quarters to top off this big fat prize. What's stopping you now, geez? So here's the official introduction. 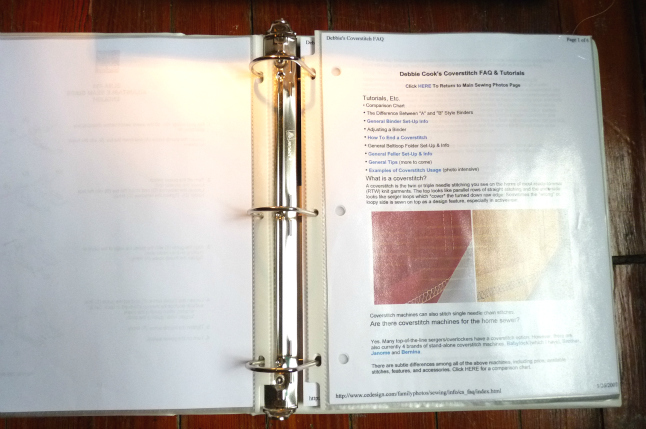 Blogosphere, meet Durant, my coverstitch machine. Unless Erin can back me up, I'm probably the only seamster in the world who names his/her machines after NBA players, as a way to combine my two nonparallel hobbies of sewing clothes and watching basketball. My serger is named Ibaka, after the (ahem, quite good-looking) power-forward Serge Ibaka from the Oklahoma City Thunder (I'd recommend this photo if you're interested). I thought the next best step was to name my new machine after another OKC player, Kevin Durant. Now my machines are a slam dunk duo. Get it? 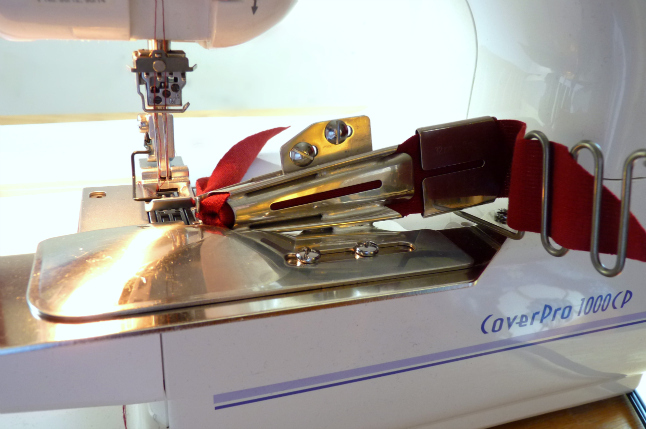 If you don't know what a coverstitch machine does, lemme briefly fill you in. It hems knit fabric to maintain its stretch. 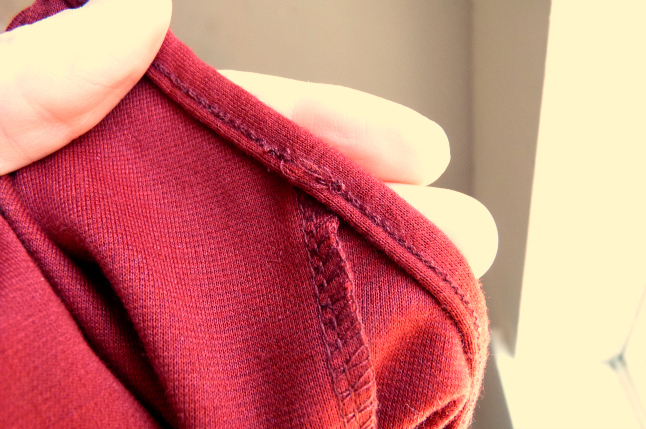 If you look at the hems of your store-bought tanks and tees, you'll notice the double line of stitching with a looped or chained stitch underneath. That's the coverstitch at work. 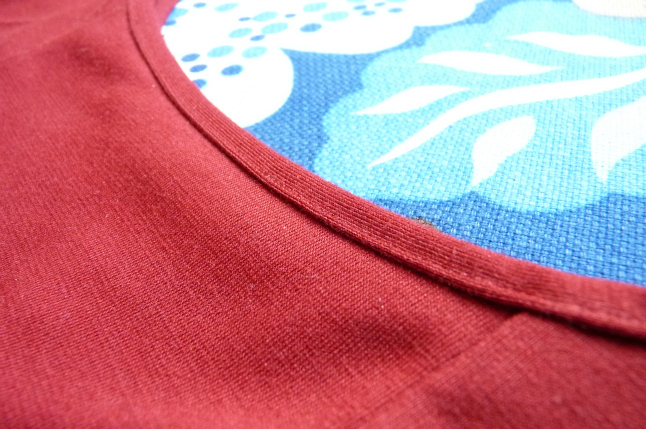 The machine can also bind necklines and attach elastic. And uh, yep, that's about it. Because of their limited functionality, most home sewers can easily do without one, and if they choose to do so, they can "fake" the look with an overlocker and a twin needle. There are only a few stand-alone coverstitch machines on the market for the average Joe sewer, and are typically only sold through dealers. The rest are industrial grade (read: cost a million bux and weigh a million lbs) or are part of a serger/coverstitch combo machine. I hear the combo machines are cumbersome to switch back and forth, removing the serger knife, etc., and I'm happy with my exising serger, so I decided to go the ideal route and get a coverstitch machine all of its own. Due to limited space, Durant lives on the floor, though, instead of on the table with his teammates. 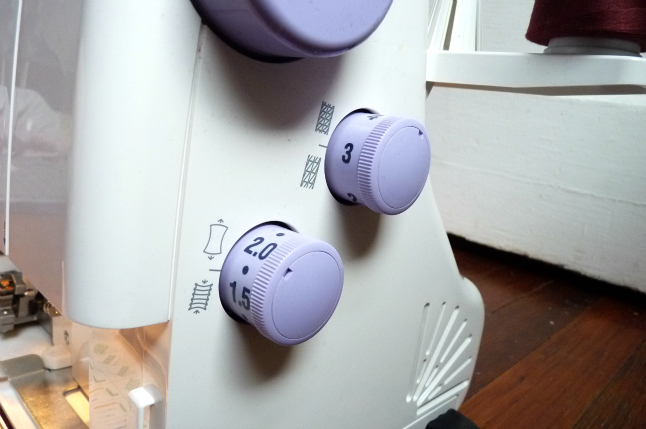 JANOME COVERPRO: WHY AND HOW? This was a total luxury purchase, I completely admit. I do work with knit fabric quite a bit, and despite knowing most of the proper techniques for hemming and finishing them, I would always stress when it came time to hem anything stretchy -- because of the high risk for wavy stretched-out hems and distorted necklines. I wasn't happy with the twin needle hemming method, because my fabric always tunneled between the stitches, it never zig zagged properly on the underside no matter what I tried, and they would easily snap on close-fitting garments that need a lot of stretching to get on and off. 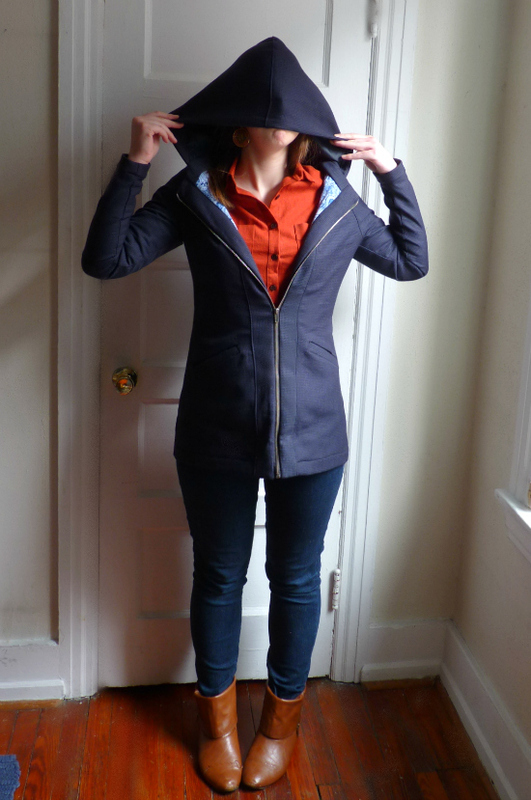 So as a birthday gift to myself, I bought a coverstitch machine to create more professional-looking garments. It hems garments quickly and evenly, and is much stretchier than a twin needle or zig zag finish. 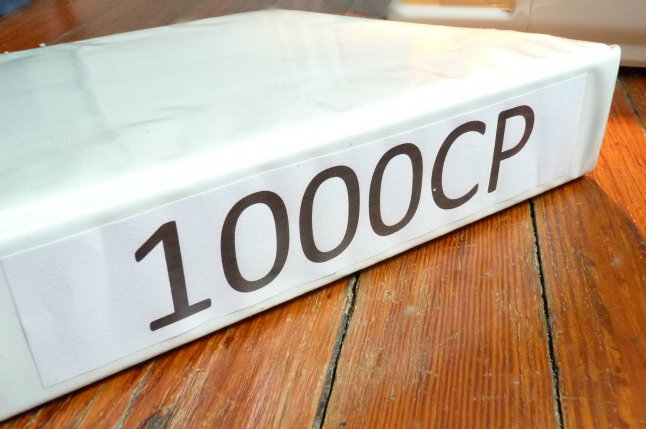 I bought a used CoverPro through the classifieds on Pattern Review. Pattern Review is a pretty amazing resource for machine reviews, I discovered. See here for reviews of the model I have. Despite how janky the website looks and how difficult it can be to navigate, PR seems to be where all the smart sewers go to dole out advice by the boatload... and there's at least 10 years of info on there. I pored through reviews of all the stand-alone coverstitch brands, and ultimately came down to a decision between the Janome CoverPro and the Brother 2340CV due to good reviews for their relatively low prices. 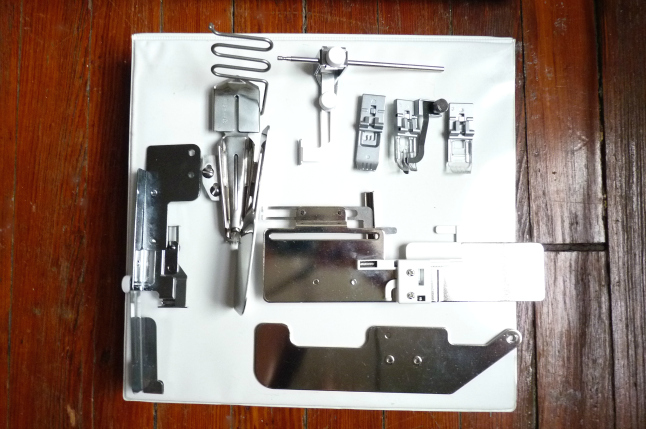 The other brands available are Bernina and Babylock but if you know anything about sewing machines, you know those are higher end ($ cha ching $). Some reviewers grumbled about the Brother not have auto tension release, whatever that means, so I just decided I'd start my search for Janome CoverPro. And sure enough, that evening, an ad came up on the Pattern Review classifieds from a woman selling her barely-used CoverPro 1000CP with all the accessories included. The CP is actually no longer made -- they have a CPX now, but from what I read, the X has a new threading diagram and a seam tightening system (?) but that's about the only difference. 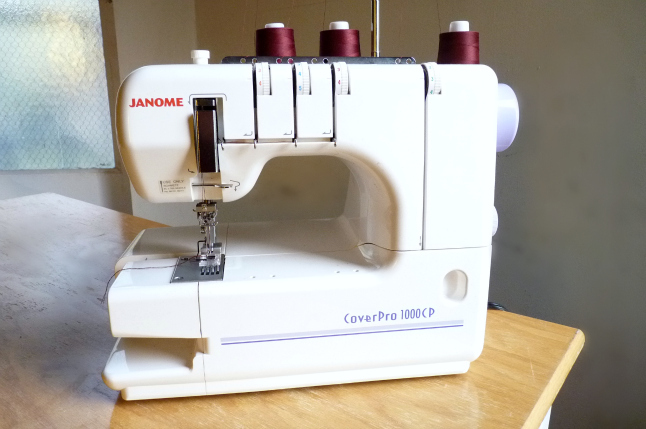 The Janome CoverPro 1000CP has capability for a triple needle coverstitch. I was attracted to this functionality because it meant you had freedom to adjust the needle spacing for double stitching -- using two needles spaced narrowly apart (one in the far left and one in the middle), or two needles spaced wide apart (one in the far left and one in the far right). Apparently some other coverstitch machines have only the option for double needles and you can't adjust their spacing. So far I've only used a single needle (which makes a simple chainstitch) and a narrow double needle. 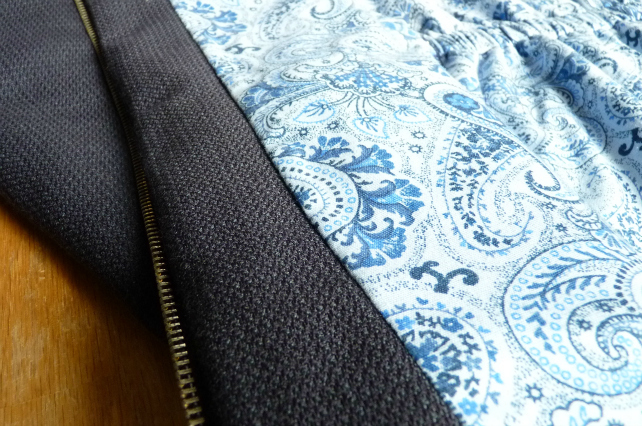 A single chainstitch can be useful for basting a garment together; it's much easier to undo since the coverstitch thread just unravels if it's not secured in a seam allowance or otherwise bound off. 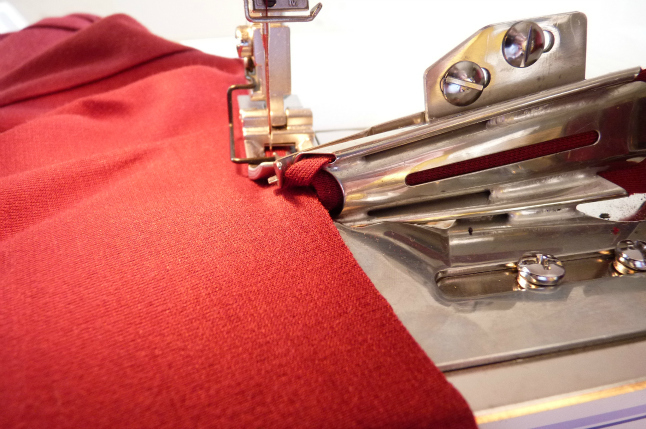 The differential feed and stitch length can be adjusted based on the stretchiness and weight of your fabric. 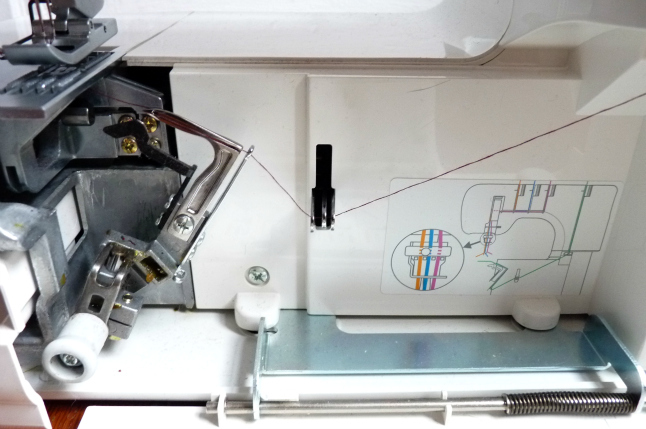 This is easy to figure out if you're used to adjusting the differential feed on your serger. 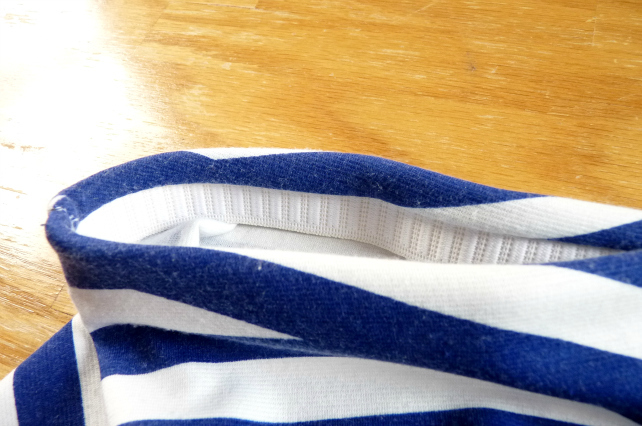 I naively hoped that a coverstitch would automatically know how to sew perfectly on stretchy fabric, but of course (of course) it is still up to the human user to adjust tension and differential feed settings in order to prevent puckering and waviness. Of course. 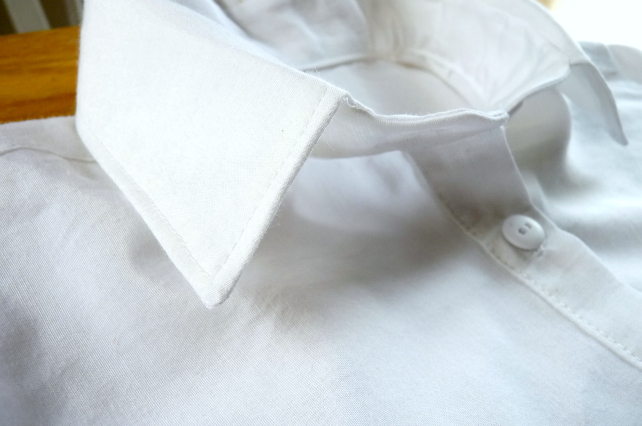 Still, though, it is MUCH easier to get an even stitch and an even hem with a coverstitch, rather than serging and turning or turning and zig zagging. 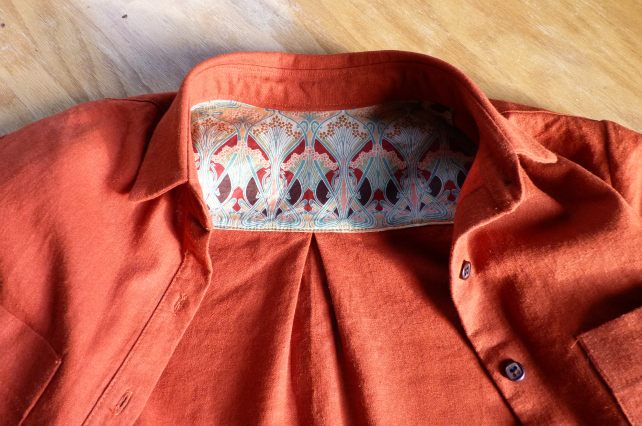 And the final polished look is so much more gratifying than a zig zag stitch. The CoverPro is incredibly easy to thread. The lower looper can be thread in three steps, probably taking a total of 15 seconds. Then all you have to do is thread your needles, which is intuitive for any sewer. 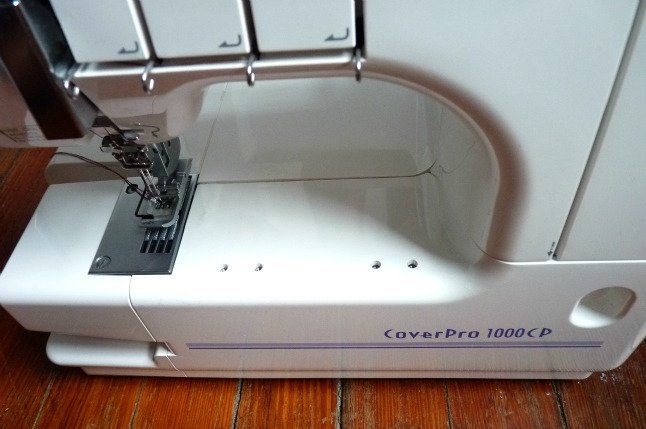 What's unique about the CoverPro is that it is designed to look like a sewing machine, with the free arm, the open space to the right of the needle, and all the knobs on the right side. 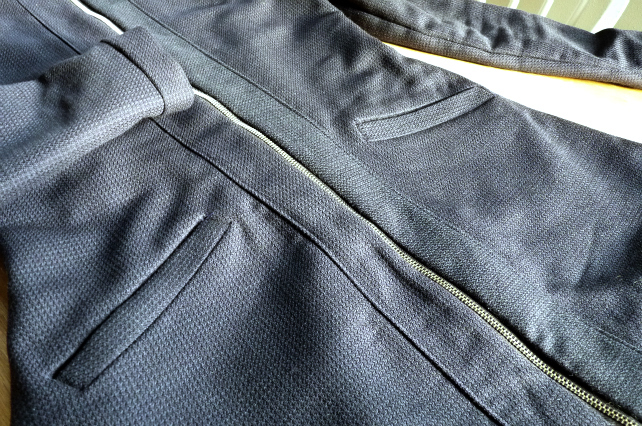 As far as I know, it's the only coverstitch with that open workspace; the other brands are designed more like sergers. 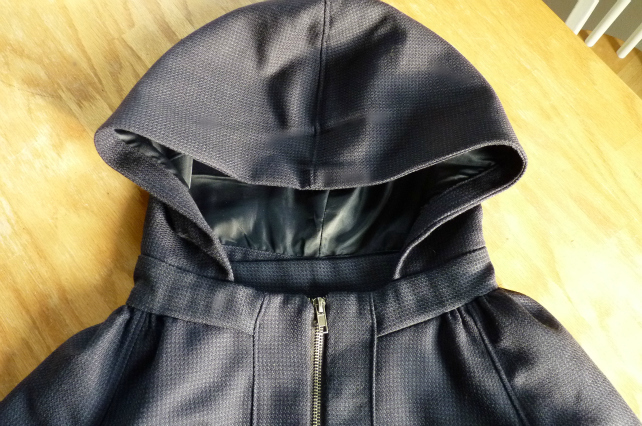 There's plenty of workspace and you can coverstitch something that is more in the middle of the garment, instead of just on the bottom. 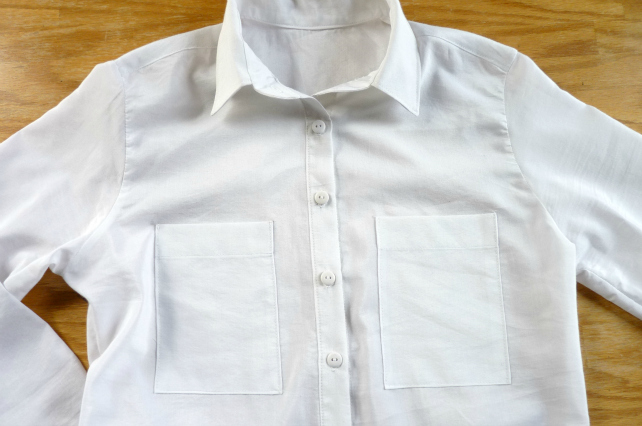 And with the free arm, you can more easily stitch a sleeve hem in the round. There were tutorials in there she had found from sewing blogs about different features and functions of the coverstitch. 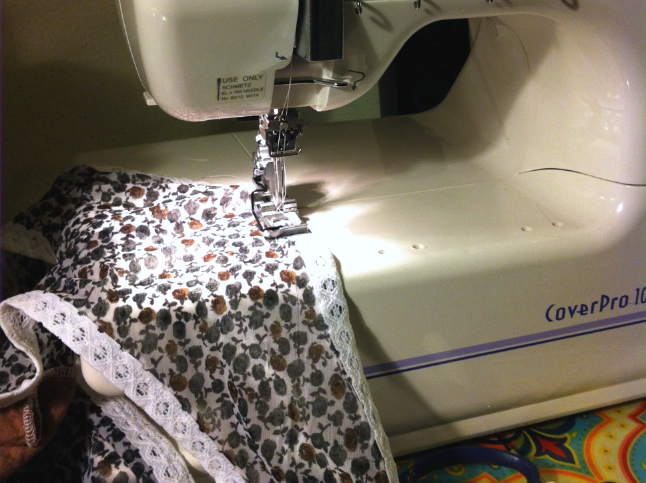 The benefit of buying a machine through the Pattern Review classifieds instead of eBay or Craigslist is that you have access to the seller's profile, their history of sewing and their participation in the online sewing community. It felt more trustworthy coming from someone who was an active seamstress and most likely took good care of her machines. She even took the coverstitch to her dealer for one last check-up before shipping it my way. 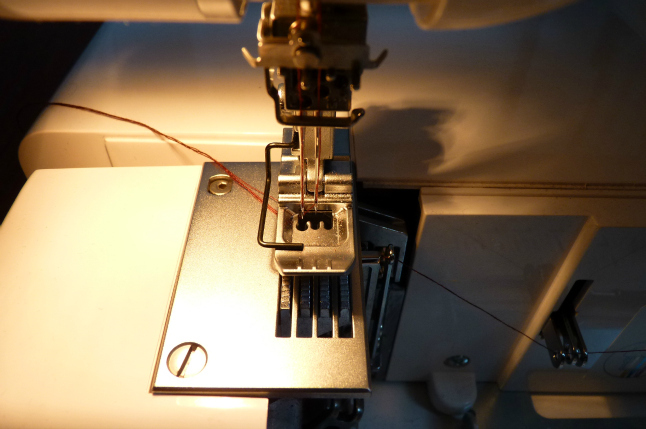 I found it pretty easy to get up and running with the basics with some help from the manual and Debbie Cook's blog, though for the most part there is not much information online about how to use this specific machine aside from Janome-sponsored resources. This is due to the fact that not many people own coverstitch machines, much less the Janome brand of coverstitch, much less have blogs or YouTube channels where they want to blab about it. Pattern Review helps, but it's a non-visual platform. 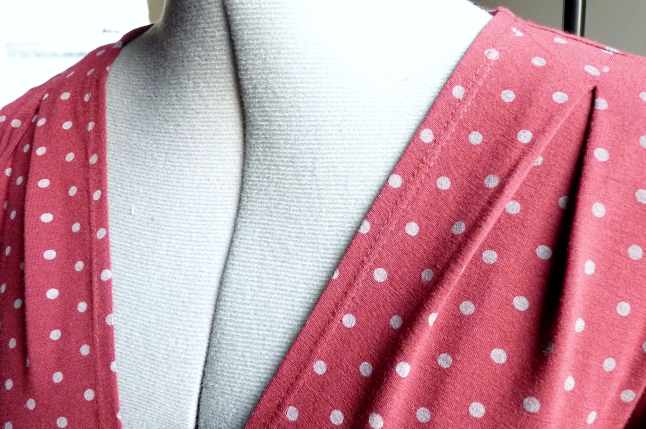 You have to bind the neckline in the flat, meaning you leave one shoulder seam unsewn and then serge it together after it's bound. Euw. So, I still have a lot to learn about binding and traversing over bulky seams. 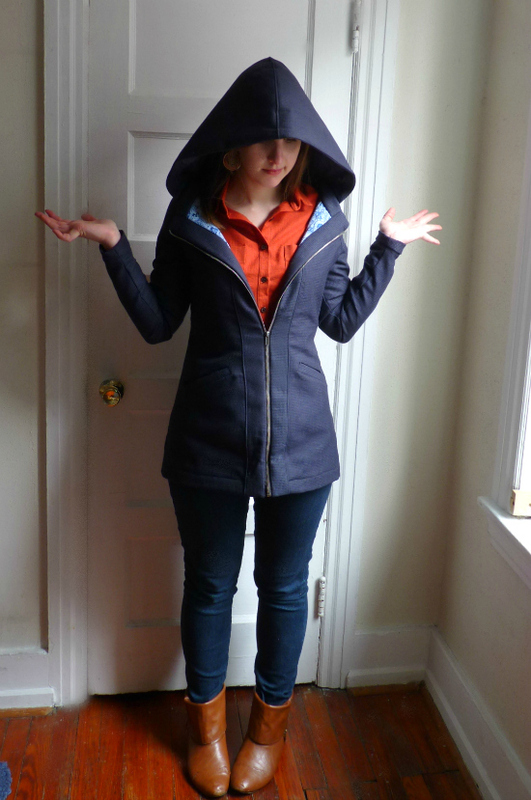 It hems like a champ, though. No wavy hems, yee haw, and I'm getting better at catching the raw edge exactly under the needles. Even with a fancy machine and crazy doo-dad attachments, you still need to measure and press accurately. I hate to say. And since I'm sure you miss seeing my face already, here's me in my new red ponte knit dress, skirt and sleeves hemmed and neckline bound with the help of Durant. That KD, he's a man of many talents. The pattern is Vogue 8665, severely de-flared.. believe it or not. So who's thinkin' about it? Does anyone else own this same machine? A different brand? What's your opinion? Am I crazy to spend that kind of money on something non-essential? Am I crazy to name my machines after pro athletes? Don't answer that. The days get warmer and my hems get longer. Bye tights, bye thighs. Hello, inner schoolmarm. It's for the best, really. And we all know how brutal the office A/C can be. What's the deal with that, man. I decided I needed some more office-appropriate garments to incorporate into my springy wardrobe. I have exhausted my two Beignet skirts and other winter-weights, so I'm starting to feel that "what-the-haaiiiil-do-I-wear" anxiety every morning now. Jersey wrap dress time was nigh. I sit on my bum at a computer all day (doing valiant non-profit work and saving lives, of course), so I welcome the opportunity to look "professional"-ish while feeling like I'm in a fancy bathrobe. 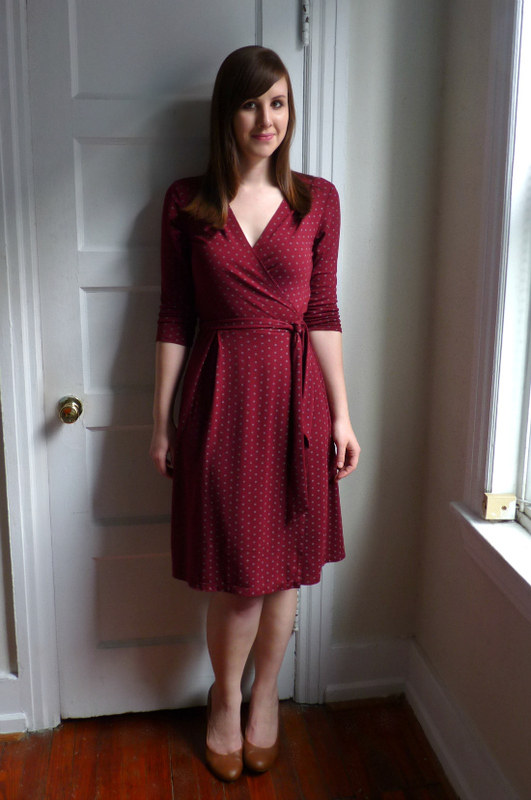 The pattern is probably the second pattern I purchased after deciding to start sewing again in 2011. It's Butterick 5546, one of those easy "See & Sew" patterns that sits on display on the back wall of JoAnn's -- I guess to try to lure in the nonchalant passersby. 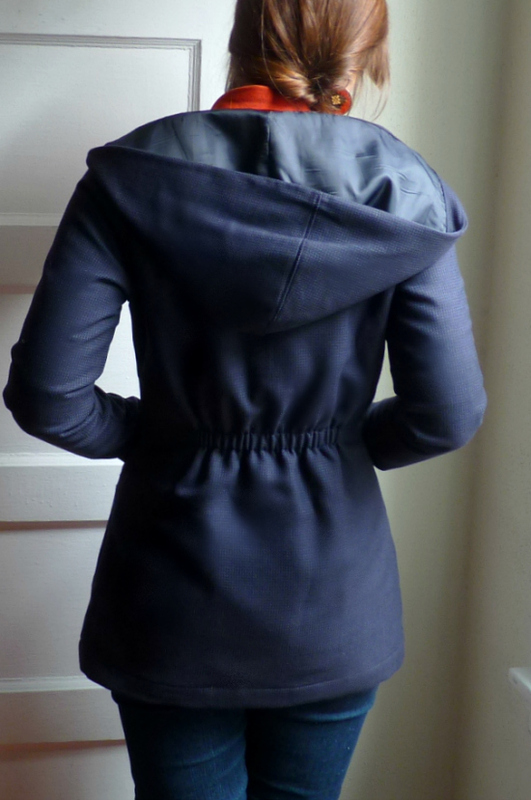 I did make this pattern when I first bought it, also in a jersey, pre-blog, pre-serger, pre-knowledge of ANYTHING, and I accidentally reversed the direction of the wrap and have snapped a bunch of the stitches because my zig zag tension was way too tight. Anyway, here's Round Deux. All I did this time was lengthen it three inches. Gee, I realize I haven't made a new pattern in awhile -- I'm on total repeat mode these days. The jersey fabric is perfect in every way: richly-hued (more maroon than the orangey-ness in the detail shots), whimsical, springy and drapey. It was sent to me as a thank you from Amy Alan for reviewing her Craftsy class (oh, did you forget? You can STILL get 50% off her Beginner Serging class through this link here). It's like she knew that maroon was one of the three serger thread colors I already owned. Brilliant much? 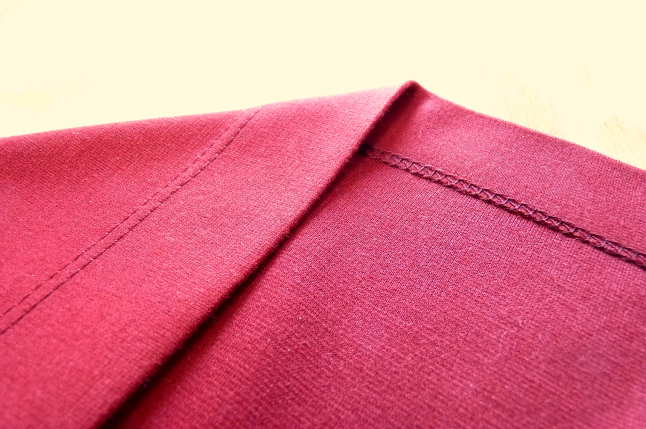 And because of her class, I knew how to overlock this fabric perfectly. Well, uh, as perfect as I am patient. 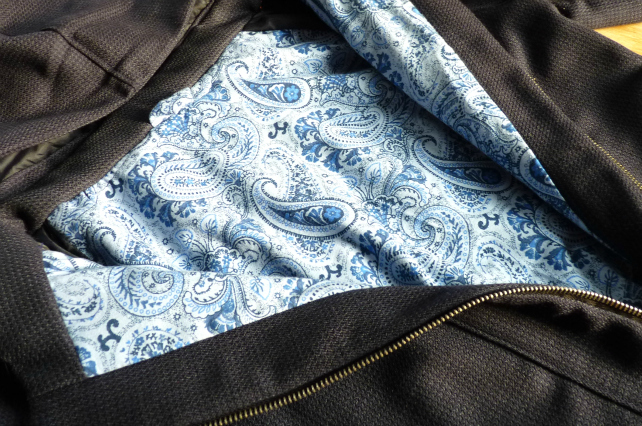 On the selvedge of the fabric it says "Matchmaster Prints by Antex of California Pattern." I googled Antex of California and it seems like it's a knitting mill that's actually in California. I just hope upon hope that that means this fabric was actually milled in the USA, though I guess it's possible it was just printed here? 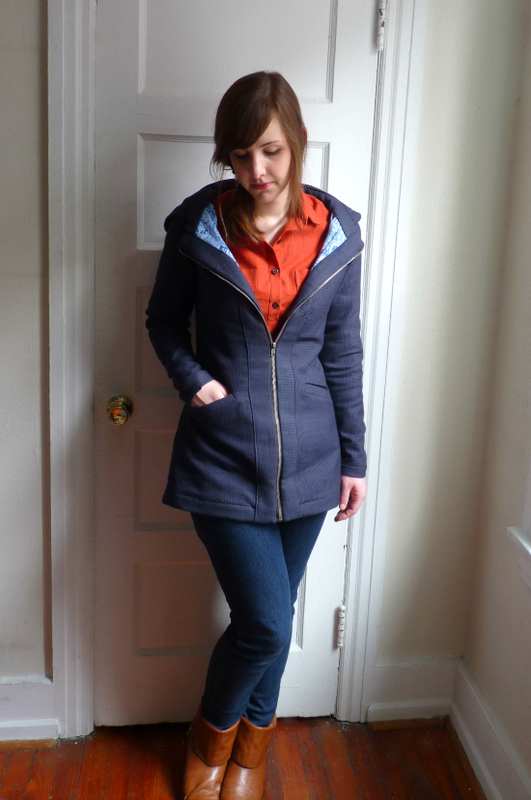 Amy said she bought the fabric at Mill End in Portland, which used to be a fabric mill in the early 20th century. If my assumptions about this fabric are correct, it would mean that my dress was resourced and made (almost) ENTIRELY in the United States, which would make me unbelievably chuffed... and mean I was one step closer to completing one of my sewing goals for 2013. Talk about cheap labor, though. No one paid me squat. 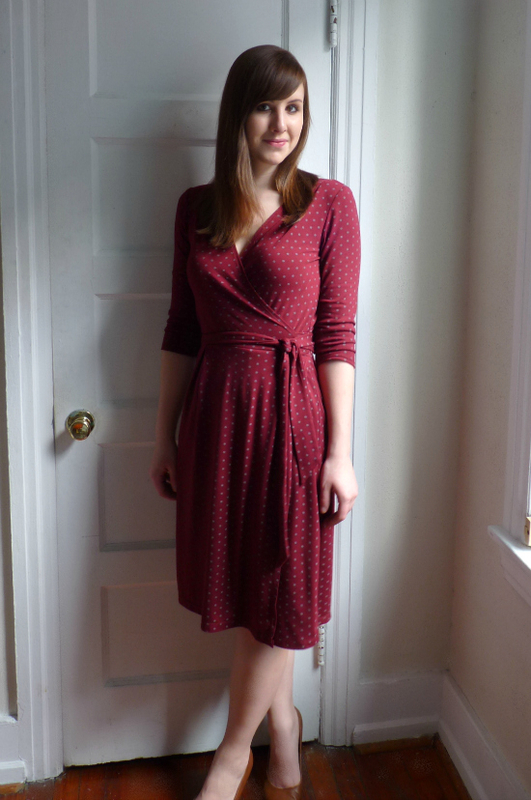 I had planned to talk more about my coverstitch machine in this post since I used it to hem all angles of this entire dress, but I still feel like I need to be more prepared to give a proper overview of the machine's functionality. To the one person who cares (Lisa G), I swear I'm working on it! I, Andrea of foursquarewalls, sign up as a participant of Me-Made-May '13. I endeavor to wear at least one handmade garment each day for the duration of May 2013.
Who's with me?! OK, better get sewing. That's morse code for SOS, did you know? I'm not in distress, though. 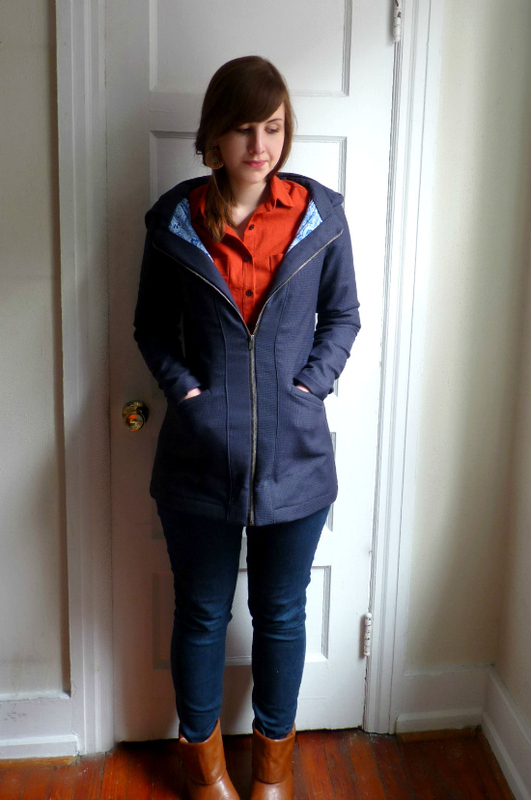 In fact I'm pretty pleased with my new handmade outfit. 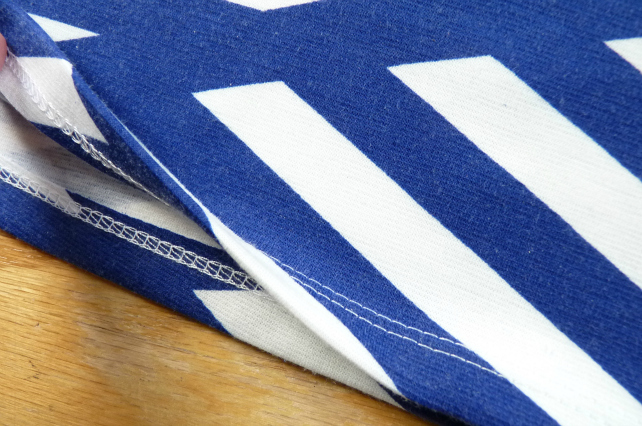 If you remember from a few weeks back, fellow blogger Trisha and I announced our little "Stashbusting our Sister (SOS) Fabric Challenge," for which we simultaneously made something with this Girl Charlee nautical-flag-stripe ponte knit we each had in our respective fabric stashes. And today is the big reveal -- to the blog world and to each other. And we actually had someone else jump aboard! After I posted about the challenge, Beth from 110 Creations commented that she had the same fabric in her stash as well. She had only less than a yard, so I'm really curious to see what she was able to make. So here's my knit pencil skirt number. Now, this challenge did not begin with pencil skirt intentions. Pencil skirts are NEVER my intention. I'm a self-conscious pear, you see. 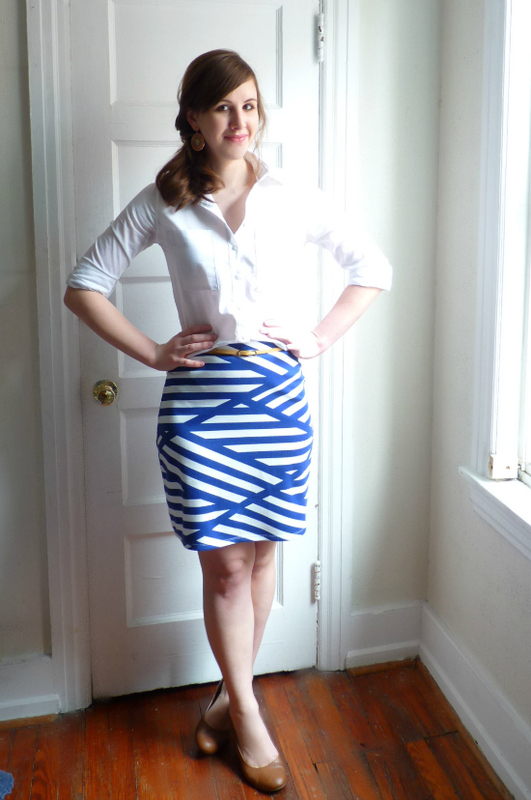 I made one pencil skirt last year (see here), but the zipper broke after two wears and I was never inspired to fix it. I was impossibly stumped about what to make with this fabric. It's just so graphic. 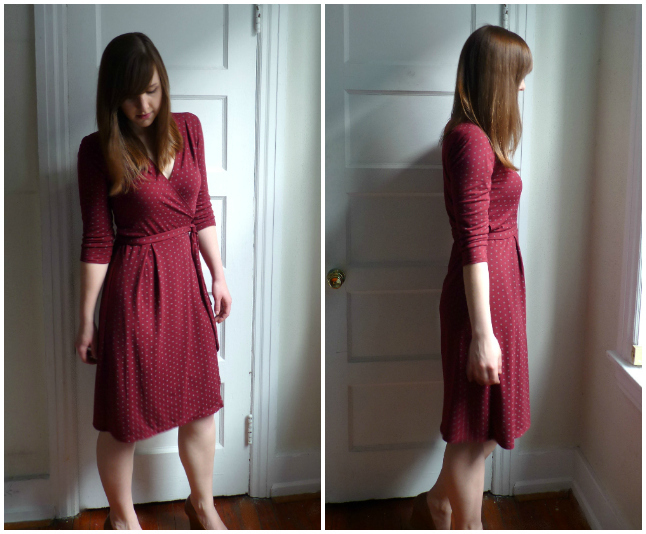 After scouring the Internet for ages, I somehow settled on the idea that I'd make it into a Colette Crepe dress. It seemed like other sewists had success with using a busy print for that pattern. So I bought the PDF, went through the laborious process of taping & tracing & cutting those 83 pages, nearly finished the dress, then decided I hated it. With four darts in the bodice, AND the cross-over back, these diagonal stripes just looked chaotic. 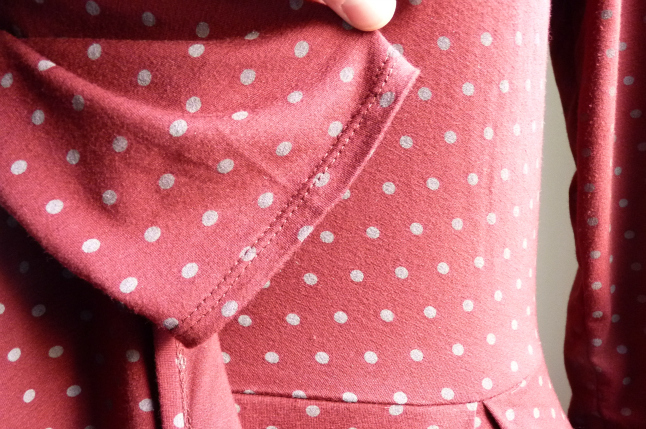 And the Crepe sleeve facings do not handle drapey ponte knit very well. Those suckers would not stay put. With my fabric already cut, I didn't have many options at that point. So I decided that this "challenge" was the perfect opportunity to make something a little out of my comfort zone. Ditch the swingy skirt, I told myself. 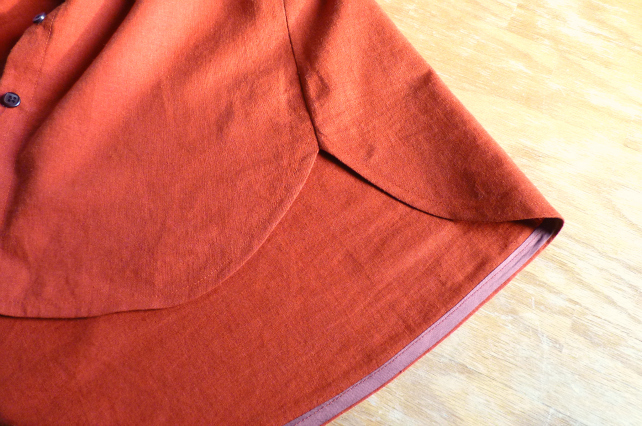 Make a STRAIGHT skirt. Use less fabric than usual. Embrace dem hips. Go wild! 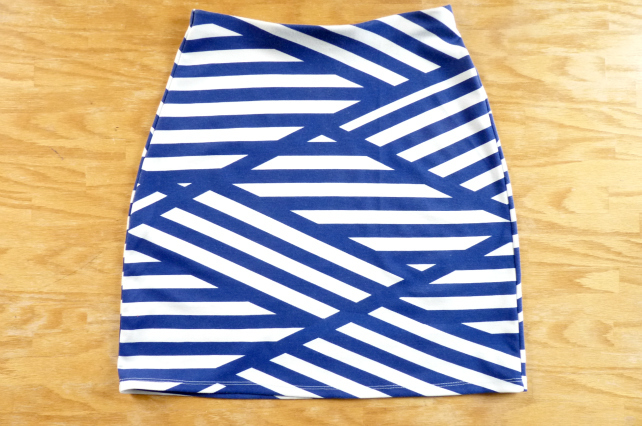 For the waistband, I followed Kadiddlehopper's tutorial for a knit pencil skirt. 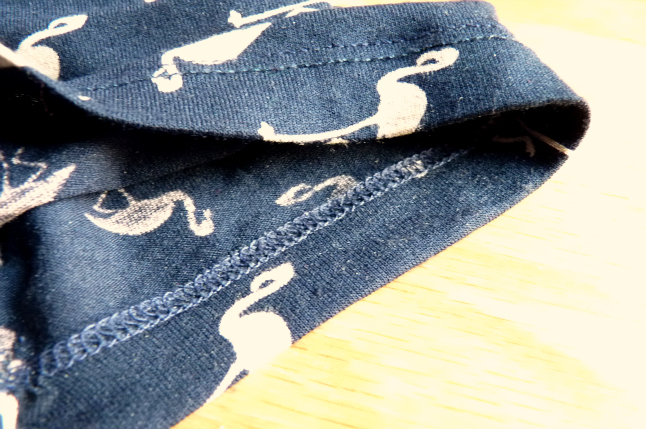 It feels slightly unfinished because the elastic is just turned down inside and tacked in place at the side seams, but it does stay put during wear, is sleek to wear under tighter shirts, and feels more stable than a simple fabric band. 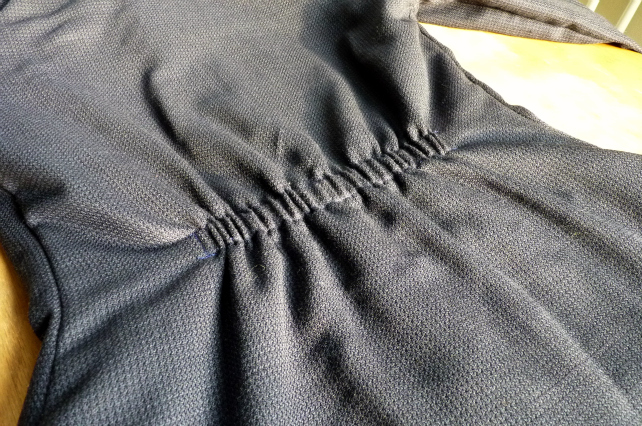 I maybe should have gone a different hemming route because the coverstitch is pretty athletic-looking. Oh boi... I just realized I haven't admitted to you all yet that I broke down and bought a coverstitch machine for myself for my birthday (...two months ago). Don't judge. Proper post will come eventually. It definitely deserves accolades, though my bank account is still feeling a bit wounded. Since I'm new to the striped-pencil-skirt world, I had to consult Pinterest and "think like a fashion blogger" in order to figure out how to style this skirt. What would Kendi do (WWKD)? 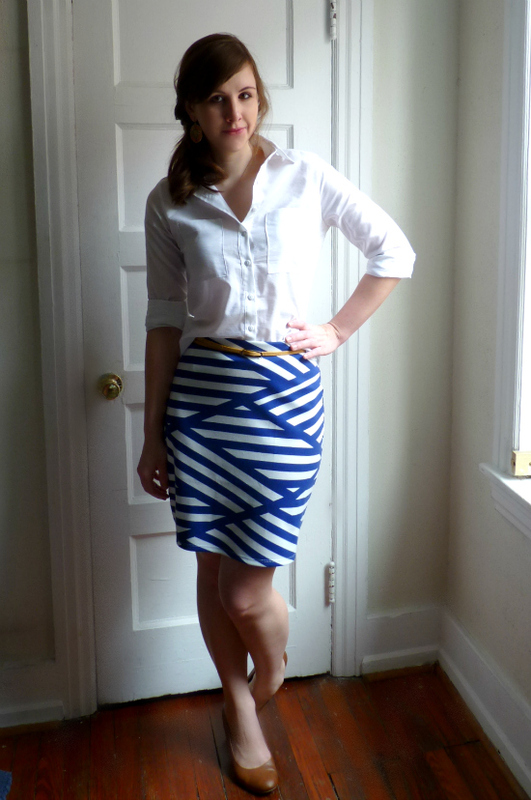 Kendi would tuck the front of a button-down shirt into her striped pencil skirt and pair it with heels (Kendi's post here). Okay, Andrea, let's do this. So the same day I finished the skirt, I immediately made an Archer shirt. This is my third Archer! Diggin' it. 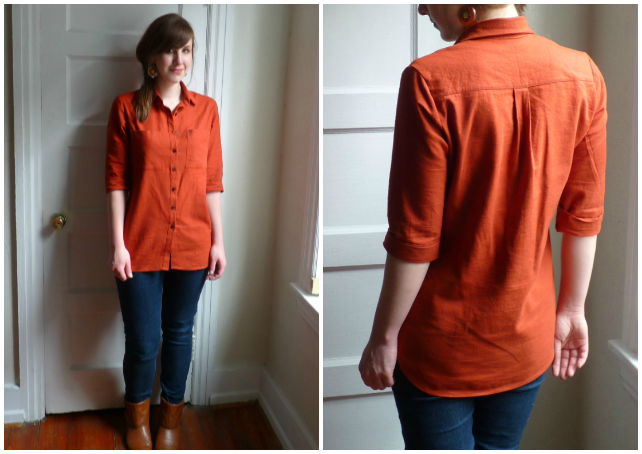 The classic-ness of this shirt helps to tone down the bold skirt fabric, methinks. I cut this Archer to be more fitted with the intention of wearing it to work with many other skirts. I made it from a bedsheet, actually, and it's unfortunately super wrinkle-prone despite the poly I know is in there. Boom. Nailed it. Though maybe I still need a sunset-drenched suburban tree-lined street as my background setting. Sorry, until I get a DSLR and a photographer husband and loads of daytime free time, you're gonna have to deal with my cracked and stained sewing room closet corner.